Inspired By Finn Teething Necklaces! All necklaces are $10.47, 50% Off! Start shopping HERE! As long as the necklace is not too snug, the length is a personal preference. A convenient way to measure is to drape a tape measurer or a piece of string around the neck to see what length you are most comfortable with. Some prefer a shorter length so that the necklace is less likely to get caught on anything & others select longer lengths so that their children can wear one size for a longer period of time. Only you can make this choice! Among other things, amber is a natural analgesic (pain reliever) and anti-inflammatory. 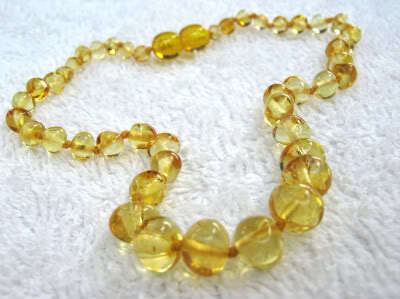 When amber is worn on the skin, the warmth of the skin releases trace amounts of healing oils on the skin. 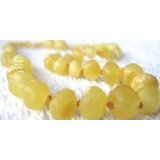 Commonly known as "teething jewelry," baltic amber has been a natural and traditional European remedy for teething discomfort for hundreds of years. Inspired by Finn's necklaces and bracelets are handcrafted with amber beads imported from the Baltic Region. They are made of authentic Baltic amber, the most esteemed type of amber in the world. The translucency of amber depends on the amount of air bubbles contained within a piece of amber and their distribution. Some believe the color is related to the type of tree source. Succinic acid is the most beneficial component of the amber. 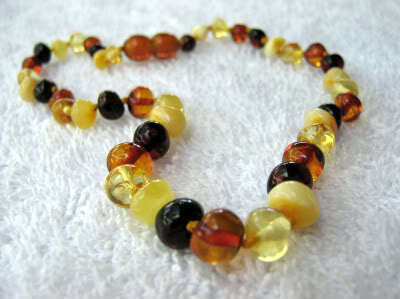 The darkest colored amber generally contains less succinic acid than lighter colors. The string the amber is strung on is designed to stretch when a good amount of pressure is applied, and break if necessary. 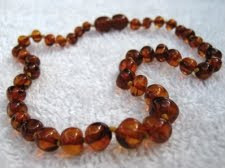 Each piece of amber is individually double knotted on the strand. The necklace fastens with a screw clasp. Hello, Neat post. There's a problem with your web site in internet explorer, may test this? IE nonetheless is the marketplace chief and a large part of folks will miss your excellent writing due to this problem. Amazing! Its in fact amazing article, I have got much clear idea regarding from this paragraph. I will right away take hold of your rss feed as I can't to find your e-mail subscription hyperlink or newsletter service. Do you have any? Please let me know so that I could subscribe. Thanks. right. This submit truly made my day. You cann't believe just how so much time I had spent for this information! Thank you! running off the screen in Safari. I'm not sure if this is a format issue or something to do with internet browser compatibility but I thought I'd post to let you know. I am not suggesting your information isn't solid., however what if you added a post title that grabbed folk's attention? peek at Yahoo's front page and see how they create article titles to get people to open the links. You might add a related video or a related pic or two to get people interested about what you've got to say. Studying this information So i am happy to exhibit that I've an incredibly good uncanny feeling I found out exactly what I needed. I such a lot definitely will make sure to do not put out of your mind this website and provides it a look regularly.